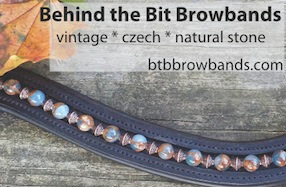 Behind the Bit: Heather Blitz and Paragon warm up: Ten great things! Heather Blitz and Paragon warm up: Ten great things! Helmet. Need I say more? 35 minute warmup. I saw a lot of riders out there drilling their horses for well over an hour before their ride. Heather's ride time was at 4:12 and at 3:30 there was no sign of her. I actually asked the steward if she'd scratched. She came out about five minutes later. Paragon's lean elegance is so different from the old-style warmbloods. His build reminds me of those old paintings of Eclipse. Look at the walk footage -- does it not remind you of a thoroughbred? Paragon's floppy ears and unfussy mouth. Black patent leather bridle with crystal browband. Not too matchy-matchy, but plenty of bling. No arguments. This was such a polite warmup. No whip! At least I don't see one, either in warmup or in the ring. Rider relaxation. The steward called Heather over because her bridle number was wrong. It was perhaps 10 minutes before her ride, and she spent the time sorting out the problem ringside. Who wouldn't have been a little tense about the last minute hassle? But Heather was pleasant and jovial, you'd never have known she was at a competition. I just got back from the WEG, and Steffen Peters after the medal ceremony rode a victory lap wearing a helmet(though he wore his top hat during his test and freestyle). Also Laura B. rode in a brown saddle with black bridle, at least in the Dressage special. Funny can't recall even looking at her saddle in the freestyle. Oops, it wasn't Laura B. with the brown saddle , but there was one woman in the Dressage Special (Tuesday afternoon)that did ride in a brown saddle and black bridle. I have to say I'm a fan of the chubbo old-style warmbloods, but this pair looks wonderfully relaxed and elegant. Thanks for sharing! I think what I like most about the way she rides is that I don't notice her. She's so still and quiet that I find myself watching the horse, not her, which I think is the point of all this anyway, right? Great video, thanks for sharing. She's done her training at home and trusts her horse. That's the best part. No need for fixes when you've done it right in the first place. What gorgeous, soft riding. Everything about the two of them working together speaks to a lovely partnership. Marissa, I agree: Heather disappears and the picture becomes completely harmonious. Thanks for capturing and sharing this footage, Stacey! Thanks for posting this. I thought he felt great in the warm up and was actually wishing I had videoed it myself :-) Have any more?? A huge fan here! I have more complete footage of the warmup plus the actual ride on Friday. Could post it on vimeo/youtube, or mail it on disk. It was such a pleasure to see Paragon in action. You must be so proud :-).